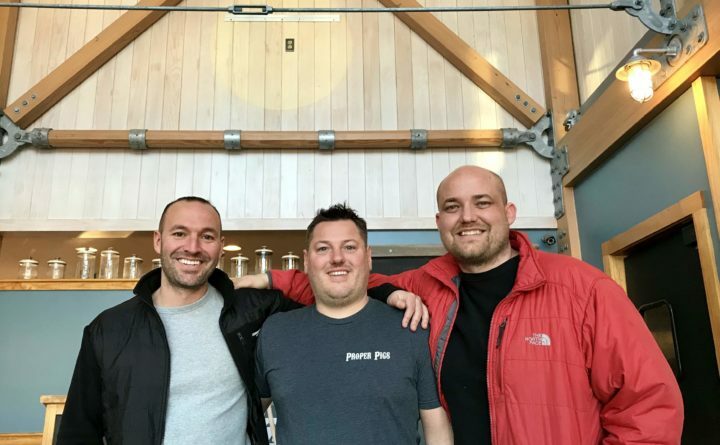 The owners of the Farm Bar and Grille franchise, from left, Noah Goldstein, Ryan Cox and Bradley Atkinson, are renaming and changing their Kittery location to feature more seafood and appeal to local diners. It will be named The Local Kitchen Kitchen and Tap. KITTERY, Maine — Owners of The Farm Bar and Grille quietly closed up shop two weeks ago, but only to reveal a new concept focused on seafood, Maine craft beer and spirits, and local people. Fittingly called The Local Kitchen and Tap, the new restaurant on State Road is expected to open this week, following a quick cosmetic turnaround; the interior now painted a periwinkle blue, and hand-painted murals of a mermaid and octopus covering the walls. The classic post and beam structure remains largely the same, but now has some new life injected into it. Opened in 2015, the Kittery location was the fourth Farm Bar and Grille, following restaurants in Essex, Massachusetts, Dover and Manchester. Co-owner Noah Goldstein said once the trio of owners began to learn more about Kittery as a community, focus started to shift towards the new concept. He noted people can still get the Farm’s famed pulled pork nachos in Dover, but ultimately the Dover and Kittery locations were too close. “We just saw a great need for a place that is very local, where the value is phenomenal,” Goldstein said. The Local’s spotlight is on Maine craft beer and spirits, with a rotating selection of local distilleries. They’re debuting with a $4.95 margarita “at all times,” not just a happy hour special. Classic cocktails will go for $6.95. The menu will be 60 percent seafood, “as local as we can,” and feature fresh Terra Cotta Pasta from across the street. Even with dishes like seafood Alfredo, pasta fra diavolo, and one called “the perfect chicken,” co-owner Ryan Cox said the entire menu is under $20. There’s also a $5.99 burger. “The prices are going to blow people away,” Goldstein said. Much of the same staff will return to open The Local, and the hours will remain 11 a.m. to midnight, seven days a week.